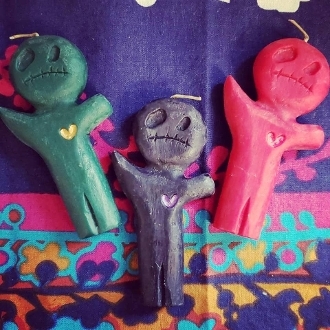 This listing is for ONE voodoo doll candle with corresponding oil. Each candle is 3.5 inches tall. ***CHOOSE YOUR COLOR FROM THE MENU. RED comes with my Love Haunt oil. GREEN comes with my Cash Conjure oil. BLACK comes with my Protection 5 oil.